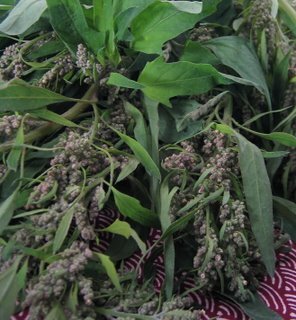 Orach (Atriplex hortensis, also known as mountain spinach, arroche, butter leaves) has a long history as an edible plant. 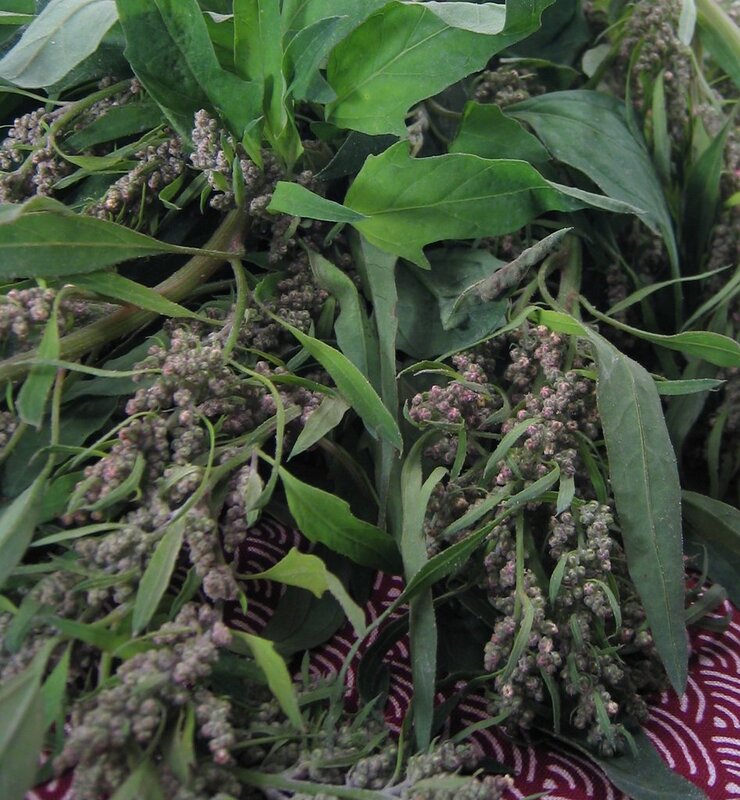 The invaluable Vegetables from Amaranth to Zucchini (by Elizabeth Schneider) says that the plant has been cultivated for millennia, was part of the diet in classical Greece and Rome, and was a regular feature in meals Europe and the United States until sometime in the 20th century. 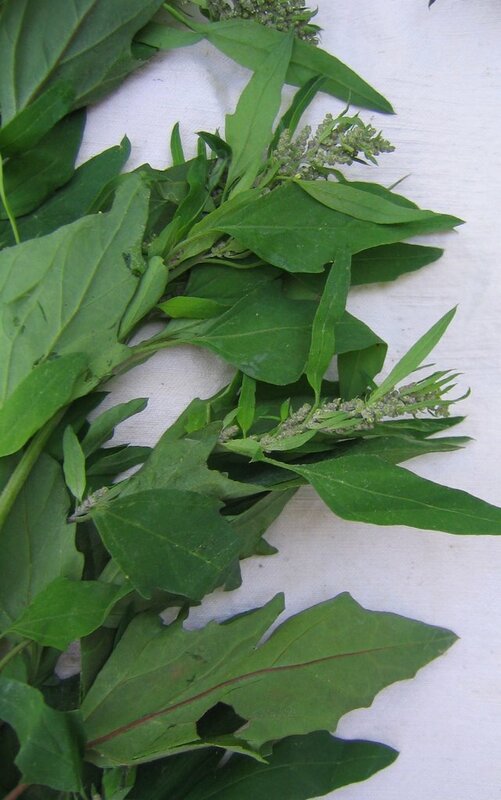 Schneider writes that orach is a close relative of lamb’s quarters (Chenopodium album), but has no mention of amaranth, so while my initial connection between the amaranth and orach might have been superficially correct, it was possibly not botanically correct. Schneider writes that the salad mix craze has caused a slight revival of orach, as its stark color and aggressive flavor make it a wonderful component of mixed baby greens. So perhaps it has always been in the salad mix I (rarely) buy, and I haven’t noticed. I prepared the bunch I bought like I prepare most greens: wash, strip the leaves from the stems, heat some olive oil in a skillet, cook a chopped garlic clove in the hot oil for 30 seconds, then carefully pour in the greens, and cook until tender. As greens go, they were about average, with a mild flavor, restrained bitterness, and minimal stringiness. Although poisonous, saponins are poorly absorbed by the human body and so most pass through without harm. Saponins are quite bitter and can be found in many common foods such as some beans. They can be removed by carefully leaching the seed or flour in running water. Thorough cooking, and perhaps changing the cooking water once, will also normally remove most of them. However, it is not advisable to eat large quantities of food that contain saponins. Saponins are much more toxic to some creatures, such as fish, and hunting tribes have traditionally put large quantities of them in streams, lakes etc in order to stupefy or kill the fish. After reading this, I think that if I buy orach again, I’ll cut off most of the seeds. Here is another link on orach, from Purdue University. I have not seen orach at the market since that day. When I visit the Happy Boy stall on Saturdays, I look for it, hoping for another chance to culinarily commune with history. But it’s only a bunch of greens; I certainly won’t end up like Mr. Bernstein and the girl with the white parasol. You’re pretty young, Mr. – (remembers the name) Mr. Thompson. A fellow will remember things you wouldn’t think he’d remember. You take me. One day, back in 1896, I was crossing over to Jersey on a ferry and as we pulled out, there was another ferry pulling in -(slowly) – and on it, there was a girl waiting to get off. A white dress she had on – and she was carrying a white parasol – and I only saw her for one second and she didn’t see me at all – but I’ll bet a month hasn’t gone by since that I haven’t thought of that girl. (triumphantly) See what I mean? Atriplex, Chenopodium, and Amaranthus are all in the family Amaranthaceae, but Atriplex and Chenopodium are indeed more closely related to each other, placed together in the subfamily Chenopodiaceae (along with the more widely cultivated Spinacia and Beta).